It’s been a big month for Masterton shearer Paerata Abraham. At the Golden Shears he won the PGG Wrightson Wool National Circuit Shearing title, taking away the McSkimming Memorial Trophy, $500 cash and a $1300 PGG Wrightson voucher. He also received 12 months free lease of a Hyundai Santa Fe which he took possession of yesterday. The victory also earned him his first-ever selection for New Zealand as one of three shearers in the five-person team – there are two wool handlers – who will take on Australia in the transtasman test early next summer. Grant Harding decided it was time to put a face to the name he’d been seeing in shearing results from around the country all summer. It’s a great story. One for Paerata Abraham’s grandchildren – perhaps. The day he debuted in the Golden Shears Open final and beat the legendary Rowland Smith to shear 20 second shear sheep . . . beat everyone, actually. It would be an even better story if Smith hadn’t gone on to be awarded the 2016 title, the third of six to date, and Paerata hadn’t been demoted to sixth and last in the final. “When you’re playing a game, you’ve got to stay within the rules and I went outside those,” he says. “It looked good but that’s about all. “It was my first Golden Shears. I was super-fit and it was working for me. “When I got to the final there was no plan. All I thought was, ‘okay anybody can win this, and I’m one of those people’. But I had a bad start – I said to myself ‘I’m not going to win this’. So, I just cut loose. “The crowd egged me on, I had energy reserves to burn and I burned every single reserve I had. It probably says a bit about Paerata’s personality. He’s one of the best in the speed shearing game – a flashy version of the sporting side of the occupation which has served so many New Zealanders well, here and overseas. Shearing one sheep as fast as you can – it’s an entertainment spectacle often held in pubs for purses that outstrip the A&P shows where the more “regimented” and famous shearers dominate. Whether or not Paerata’s first Golden Shears story will be what he tells his grandchildren remains to be seen, because in his 35 years he has continued to evolve. Always at the centre of that evolution is shearing. Born in Dannevirke, the youngest of four siblings to parents working in the industry, it’s in his blood. His parents separated when he was young. After a year at Palmerston North Boys’ High School he moved down to his mother in Alexandra in Central Otago, 40 minutes from Queenstown, where he attended Dunstan High School. During high school holidays he was employed crutching – “when you go around the bottom and take off the crap and then it’s just good wool only”. It’s fair to say, he wasn’t a fan of the industry. At that stage he was into basketball and rugby – “mainly rugby”, where he played in the front-row. He was 105kg which is difficult to believe when I look at the super-fit man before me – 1.78 metres tall and 82 kg. Upon leaving school he went to Australia, but quickly returned home. “I was 18 when I got back from Australia and I needed a job. I went back out to the shearing sheds – I enjoyed it. “I realised that people liked people that wanted to work hard. At that time, the nomadic life appealed and Paerata travelled all over New Zealand before heading overseas, as many Kiwi shearers had done before him. In Australia, the shearing was similar, but in Great Britain it was another world. “We have shearing buildings, they don’t. We have four to five million people, they have 60 million and the land is the same size. “So, you’ve got a lot of farms over there cut up, and you’ve got a lot of big farms over here. Over there you just drive around with a trailer and a generator and you go and shear little mobs. Whereas over here we’ll go to a place and do thousands. “Because it’s so small they don’t have the infrastructure, so you’re just shearing out in the elements. Sometimes your surface isn’t even flat. Sometimes you’re on the side of a hill. “Some of the farmers’ skill sets are not that great – shepherding. It’s very frustrating, it’s what we think is time wastage. “Then you just learn to deal with it. You get out of your routines and you begin to appreciate what we do have in New Zealand. Paerata admits he was the stereotypical hard-living shearer at that time, while these days he drinks alcohol rarely. Around eight years ago, he moved to Masterton and met Cushla Gordon, from a well-known Masterton shearing family. She was the Golden Shears novice shearing champion in 2008 [and last year was Wool Pressing champion] and is now his wife. Introduced to her mother, Marie shortly afterwards, Paerata met someone who “walked the talk” as a Christian. “As kids we used to poke fun at [Christians]. But her mother stood out to me. “Once I found out that you could have a relationship with a higher power, for me it was like something you could never take away from me. It was quite appealing. The bible taught me how to live a better life. 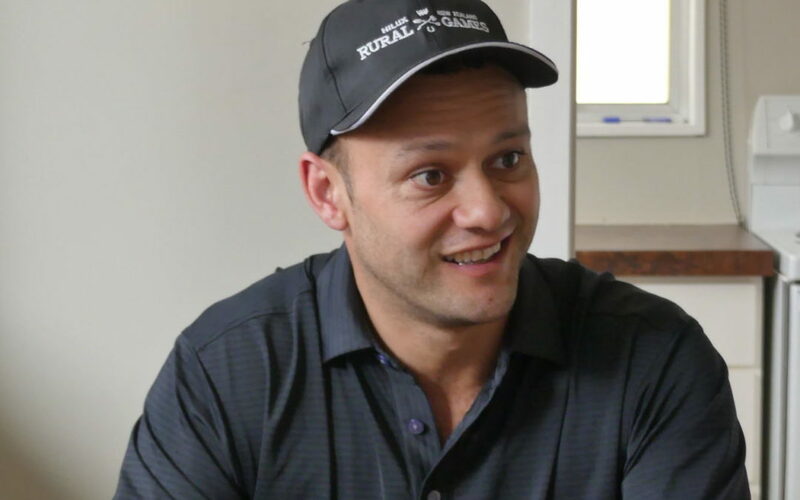 These days he’s a member of the non-denominational Masterton Community Church, is a dedicated husband, father to two daughters – six-year-old Ariana, and Mei-Marie, nearly two – and for the past three years, a businessman, running two shearing crews who have diversified into crutching and vaccination. It’s an ultra-disciplined lifestyle, with shearing sometimes taking place 30 to 50 days in-a-row. It’s allowed him to provide a good living for his family without travelling overseas for work, and to bring his previous experiences to bear. “Now I notice a lot of people who remind me of myself, and I’ve got to be careful . . . because I can get quite hard on them. I know what they’re going through, I know where they are, I’ve done all that. “I find it really easy to explain to them the reason they’re getting the results they’re getting, and it’s up to them what they want to do. You can’t make anyone do anything. “With our crew they understand that we provide an atmosphere that’s positive for everybody from the farmer to the worker and so we expect people to present themselves. If they’re turning up and they’ve been abusing themselves night after night I wouldn’t put up with that. “Unfortunately, it takes you a few years to get experienced enough to chuck that away. I remember when we used to do it. Feeling like rubbish is the routine. Everyone is doing it. That’s what we did. Of course, Paerata’s presence in the competitive shearing world has also grown as a result of his lifestyle changes. At present, he rates himself at the bottom of the top echelon of show shearers, but one of the best in speed shearing. “It’s a discipline you can get good at quick. If you win, on average it’s a $1000. “There’s at least one every weekend, maybe two. By making the final you can win an easy $300. So that definitely helps with the affordability – makes it easier to travel to all the places we go. Paerata almost always flies to competitions so as he can be back for work on Monday. He travels alone or is accompanied by fellow shearer and brother-in-law David Gordon. The family only come to competitions that are nearby. While the Golden Shears Open remains the holy grail – he was eliminated at the semi-final stage this year – he says his win in the PGG Wrightson Wool National Circuit Final, the culmination of several qualifying events around the country, has given him increased confidence. In an event which requires the shearing of three merino sheep, three corriedales, three long wools, three second shear and three lambs it was his focus throughout the near 18 minutes he was on stage that pleased him most. “I’d done a lot of mental work on my shearing this year basically focusing on the present moment. “I knew I was doing really well, and I had to snap myself out of that thought because I had to focus on what I was actually doing. That was a big part of it, just keeping my mind on the job while the crowd was going silly. “You know when you are doing well, and when you aren’t. It’s how easy you are doing it and how comfortable the animal is. You don’t notice the penalties on the animal. “I’d only had one win prior to that so I’m not familiar with how to win on the show circuit. 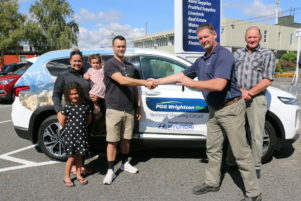 He knew he’d won the use of a car for a year, but it was a “wow” moment when he was told the win secured him a place in the New Zealand team for the transtasman test in Dubbo, New South Wales, later this year. While he remains ambitious his priorities have changed these days. “Once you can provide for your family that’s the main thing,” he says. “If I lost my arm right now would I still be a happy man? The answer is ‘yes’. “I’d still have a family. I never would have pictured I’d look at my kids and my wife and be so thankful for those moments.